Microorganisms along with their activities are fundamentally important to almost all processes on earth. Micro-organisms are in us, on us and around us. Because they affect every aspect of our lives- thus they matter. Microbiology comprises of the study of all living organisms that are too minute to be seen with the naked eye. This takes in archaea, bacteria, viruses, prions, fungi, protozoa, and algae, together known as ‘microbes’. These microbes play crucial roles in biodegradation/biodeterioration, nutrient cycling, climate change, spoilage of food, biotechnology and also the cause and control of the disease. A microbiologist is someone who works in the domain of microbiology. He is a scientist who makes a thorough study of the microorganisms. Microbiologists examine the characteristics of microscopic organisms such as bacteria, viruses, and fungi. The microbiologist tries to investigate and understand the behavior of miscellaneous microbes and their impact on human lives. Microbiologists might sometimes handle perilous organisms in the course of their research, thus making the work hazardous. Research in Bacteriology, Virology, Mycology, and Parasitology are some of the specialist fields for microbiologists. Some of them also specialize in agriculture, environment, food and medical aspects. The microbiologists develop many vitamins, enzymes, and hormones. They further amplify new approaches to combat the diseases. Bacteriologists: They study the pattern of growth, development, and other characteristics of bacteria, including the positive and negative effects that can be brought about by bacteria on plants, animals, and humans. Clinical microbiologists: They execute a vast range of medical laboratory tests on collected specimens from plants, animals, and humans to aid in the detection of disease. Those microbiologists (clinical and medical) whose work takes in researching human health directly may be categorized as medical scientists. Environmental microbiologists: They make a study of how the interaction of microorganisms with the environment and with each other. They also study the use of microbes to clean up the sites contaminated by heavy metals and further investigate increasing crop growth with the aid of microbes. Industrial microbiologists: Industrial production processes are studied by them and also problems related to these processes are being solved. Examination of microbial growth in the pipes of a chemical factory may be done. Further, they can also keep an eye on the impact of the industrial waste on the local ecosystem, or even supervise the microbial activities involved in cheese production to guarantee the quality. Mycologists: They study the characteristics of fungi such as mold and yeast. A study is made to find out ways of how fungi can be beneficial to the society (for instance, in the environment or food) and also the risks that may be posed by fungi. Parasitologists: Life cycle of parasites is studied. Further, the host-parasite relationship and the adaptation of parasites to different environments is studied. The outburst and further control of parasitic diseases such as malaria may also be investigated. Public health microbiologists: Examination of specimens is done to pursue, regulate, and avert transmittable diseases and other health perils. Laboratory services are provided by them for local health units and community health programs. Virologists: Structure, development, and further properties of viruses are studied and, further any effects that viruses have on infected organisms is also being researched. At least a bachelor’s degree in microbiology or a closely related field is required for would-be microbiology scientists. A concrete foundation of the sciences is needed. Microbiology majors pursue courses such as virology, microbial chemistry, biochemistry, physiology, and physics. A number of these courses comprise a laboratory component, which is crucial for soon-to-be microbiologists. Microbial genetics and microbial physiology are the core courses taken by most microbiology majors, while elective classes are such as environmental microbiology and virology. 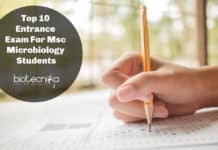 Students should also have a knowledge of other sciences, such as physics, chemistry, and biochemistry because it is essential for microbiologists to have an extensive understanding of the sciences. 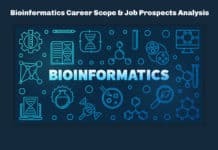 Courses in math, statistics, and computer science are vital for microbiologists as they may need to perform complex data analysis. Having laboratory experience is crucial for prospective microbiologists before moving into the workforce. Nearly all undergraduate microbiology programs contain a mandatory laboratory requirement, however supplementary laboratory coursework is recommended. Students can also acquire valuable laboratory experience out of internships with potential employers, such as drug manufacturers. Microbiology is a flourishing field that should offer good outlooks for qualified workers. A number of the applied research projects where microbiologists are involved in necessitating the expertise of scientists in various fields such as chemistry, medicine, and geology. Microbiologists with a little familiarity with another branch of learning should have the finest opportunities. In order to carry out independent research and work in colleges and universities, microbiologists usually need a Ph.D. Class work, laboratory research, and completing a thesis or dissertation are included in a Ph.D. program. 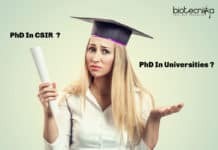 Many microbiology Ph.D. holders initiate their careers in provisional postdoctoral research ranks. During the postdoctoral appointment, they work with knowledgeable scientists as they go on with learning about their specialties and create a broader understanding of related areas of research. Postdoctoral positions offer the opportunity to publish research findings. Requisite degree levels vary on the basis of position. For many settings, a bachelor’s degree in microbiology is ample, while for advanced research work, a doctoral degree is obligatory. Voluntary certification is obtainable through numerous organizations, including the American Medical Board of Microbiology and the National Registry of Certified Microbiologists. Lab experience is required for aspiring microbiologists; postdoctoral research work may be required for advanced research positions. Basic skills include interpersonal, analytical, mathematical, speaking and writing expertise, and further being detail-oriented. Knowledge of query, medical, scientific, and spreadsheet software is fundamental to this position. A variety of specialized equipment such as gas chromatographs and electron microscopes must be appropriately used by a microbiologist. If one thinks of a science-based career, pre-entry experience in a laboratory becomes advantageous. 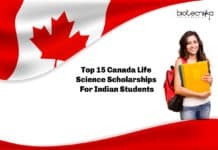 A few of the degree courses may include a year’s work assignment carrying out scientific research in a government research laboratory, in an industry or other pertinent organizations. Certain companies take care of funding to sustain research work in laboratories during the summer. In order to obtain information on these opportunities as well as other internships, it is advisable to contact various career services. Further, contacts can be extended to local hospital laboratories to uncover work experiences or even work shadowing opportunities. Valuable networking opportunities can be provided if one has joined the membership of a relevant society or a professional body such as the Microbiology Society and the Society for Applied Microbiology (SfAM). By being a member of such organizations, one can get access to grants and also discounted or free conference attendance. Employment of microbiologists is estimated to grow nearly 8 percent over the coming ten years, which is as fast as the average for all professions. More microbiologists will be required for contribution to basic research and for solving glitches of industrial production. There will be a need for microbiologists to conduct research and thus develop novel medicines and treatments, such as antibiotics and vaccines. Besides, pharmaceutical and biotechnology companies will need microbiologists to develop drugs which are produced with the service of microorganisms. Alongside improving health, further areas of research and development are expected to cater to employment progress for microbiologists. Microbiologists will be needed by many companies, from chemical companies to food producers, to warrant product quality and production effectiveness. In an expedition to find more clean sources of energy, microbiologists will be involved, such as industrial microbiologists and mycologists, who research and develop alternate energy sources such as biomass and biofuels. Further, microbiologists will be needed in agriculture to help in developing genetically engineered crops that offer superior yields or involve less fertilizer and pesticide. Lastly, the use of microbiologists will be made in endeavors to uncover up-to-the-minute and improved ways to safeguard public health and preserve the environment. Microbiologists mainly worked in laboratory research settings in decades past. With the potential role of microbes in biotechnology as well as their new appreciation in environmental and human health, microbiologists today work as intact members of interdisciplinary squads in clinics, hospitals, industry, universities, and government. They are on the cutting edge of science. Industry – water and biotechnology companies, food and drink, toiletries, petroleum, pharmaceuticals. If you are looking for a job as a Microbiologist in India, your average starting salary as a fresher will be around Rs 3 Lakh p.a. With Experience and ample skills acquired you can climb up the career ladder and grab a pay package of up to Rs 10 lakh p.a. If you are looking forward to a stable and long term career in the field of microbiology a Ph.D. degree in Microbiology or related subjects will just to the magic for you. Top City That Hire Microbiologists – Location wise Bangalore tops the list with more number of companies & institutes that hire microbiologists. Pune, Hyderabad, Mumbai & Chennai comes next on the list. Microbiologists typically accomplish experiments and analyze the results while they work in laboratories, offices, and industrial settings. Strict safety procedures must be followed by microbiologists who work with hazardous organisms, in order to avoid contamination. Basic researchers who are involved in working with academia usually pick the focus of their research and run their own laboratories. Applied researchers who are involved in working for companies making a study of the products that the company will sell or further suggest amendments to the production process, so as the company can turn more efficient. Funding the research by basic researchers is often fulfilled by winning grants. These grants every so often put pressure on researchers to meet the deadlines and various other specifications. A competitive selection process is generally preferred for awarding the research grants. Microbiologists of diverse specialties can work as research scientists, lecturers or professors at colleges or universities. By and large, research scientists only conduct research and lecturers only teach, while, professors usually do a mix of research and teaching. In science, the steps involved in “research” include writing down grant proposals in order to get funding for designing and carrying out experiments, for evaluating the data, and for publishing the findings in scientific journals. Professors do have the additional responsibilities of handling their labs and further mentoring others who work in their labs. Teaching at a university or college involves designing the classes, delivering lectures, leading labs, and mentoring the students. Professors, as well as lecturers, can teach hefty undergraduate courses, such as Biology, or small, graduate-level electives, such as Environmental Microbiology. Typically clinical microbiologists operate in hospitals, as well as in medical, public health, or veterinary laboratories. They conduct various tests on animal or patient samples sent to the lab by veterinarians or doctors respectively. These tests assist in identifying the microbe that makes a patient/animal sick and can facilitate the doctor/veterinarian with treatment decisions by determining whether the microbe is sensitive or resistant towards common antimicrobial medications. Clinical microbiologists likewise work with public health executives to track outbreaks. When at higher career levels, microbiologists progress new diagnostic tests and procedures and may thereby manage an all-inclusive clinical laboratory. Microbiologists can furthermore work for industrial companies or in commercial applications. A number of microbiologists conduct research to aid their companies in developing new products and further improving industrial processes or prevailing products. “Products” can be miscellaneous, such as anything from plant parts that are resistant to infections (such as agricultural biotech companies) to probiotic yogurt (in food companies). “Industrial processes” can take in microbes to extract minerals (in mining companies), to clean up pollutants (in sewage companies), and further to formulate medicines (in pharmaceutical companies). A number of microbiologists also work in quality control thereby making sure that products are safe and that they do not deteriorate due to microbiological activity over time. Microbiology, furthermore, overlaps with other fields of biology such as molecular biology, genetics, and immunology. This projects that there are several opportunities for a microbiology-related career in an extensive range of zones. Finally, a few microbiologists also combine their technical expertise with various other fields. Hybrid careers comprise of, science writing, public policy, patent law, infectious disease medicine, education, and business analysis. However, most of these hybrid careers necessitate supplementary education or further experience in a field foreign to microbiology. 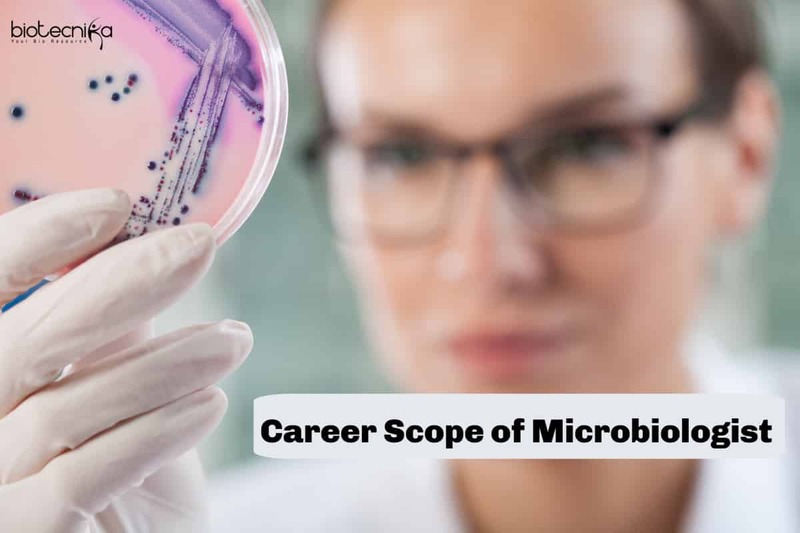 So to summarize in this article we talked about Microbiologist – Career Requirements, Career Scope of Microbiologist, Certifications, Eligibility, and skills required, Top Companies 7 Institutes that hire for Microbiologist Post, Average Salary of a microbiologist and much more. If you have any questions related to your career as a microbiologist after your Bsc / Msc Microbiology or Ph.D. microbiology please do comment below. She is an avid follower of the latest life science journals and has quite a number of publications of her own piece of work. 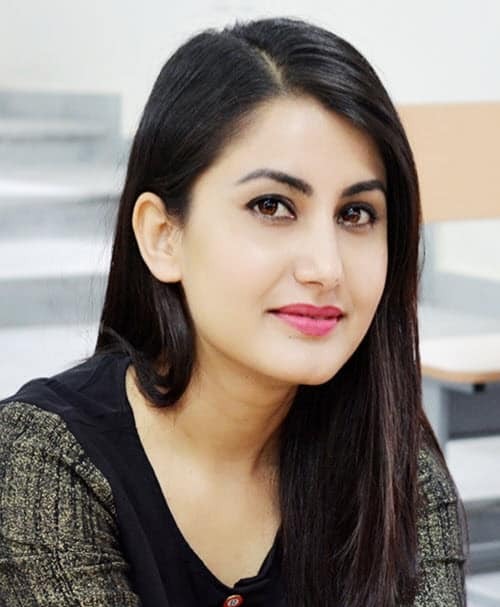 She has also been the most patient and a loving teacher to all our students for her true interest in dedicating her immense knowledge towards them. The above article has been penned down by her based on her experience & research she did in the field of Microbiology. i am a student of microbiology 2nd year. along with my further education and move for research feild. I have completed my masters in microbiology in 2016. I am looking for opportunities to work in the microbiology field. Please help me out and suggest me how can I prepare myself better for the microbiologist job. I have completed my master degree in microbiology 2016. Can you please help me to get a good job in same field in our locality and how should I prepare for it? I have done masters in applied microbiology and currently working as microbiologist in pharmaceutical company. What’s the scope for me? Sir I completed my msc in 2017 please help me how to apply as a microbiologist in the companies as a fresher.